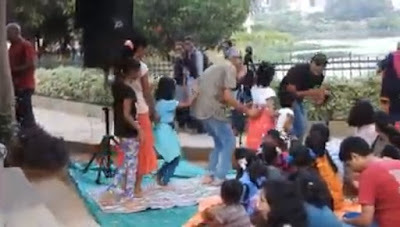 Those of you who missed the Children's Day Celebration at the Puttenahalli Lake on 17th Nov. really did miss something! Anjana Padmanabhan, the winner of Indian Idol Jr. 2013 is a pleasure to listen to. What a voice, what singing! She is a professional performer at this young age! 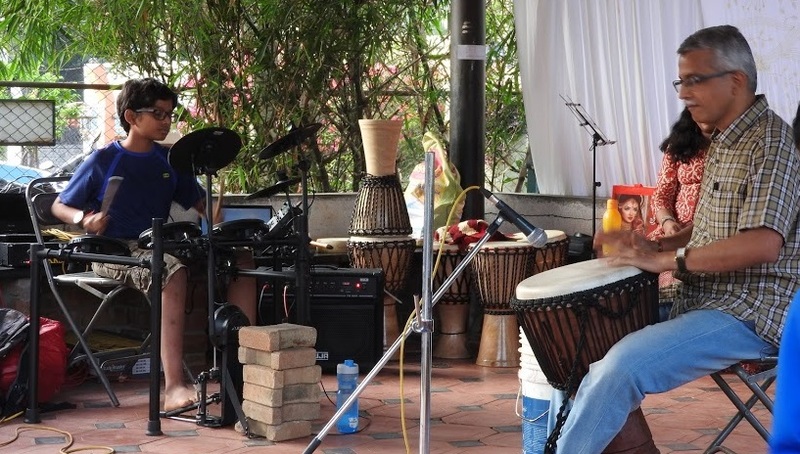 The drum jam led by Ashirwad Achrekar and his 14 year old son, Arnav, was packed with energy. And boy! Did the audience revel in it! What was particularly heartwarming to us was the number of new faces in the audience. It seemed that the community was coming together to celebrate children's day at the lake. Our sincere thanks to Anjana, Arnav and Ashirwad, and to Jaishree Govind and S.K. 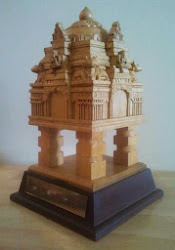 Srinivas who took the photographs and videos. Here are two reports on the event from our volunteers. 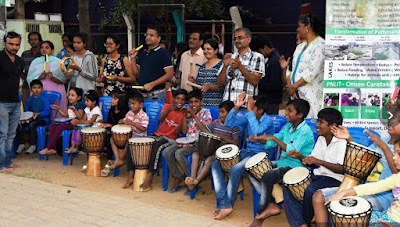 "Saturday Evening ...Gazebo of Puttenahalli lake tucked amidst concrete jungle of the city.. people of all age groups having gala time for the wonderful music so much that all the living creatures resonated with lots of joy.. the flora and fauna danced to the tunes of the music .. It had singing to dancing to drumjam to keep up the fun . The photographers would have had a gala time as they didn't to say 'say cheese" as almost everyone was smiling and joyful to their heart content!!" It was an absolutely thrilling children's day celebration at the lake filled with high energy performances and participation from children of all ages. It was a good turnout with more than 100 people turning up. The performers for the day were Anjana Padmanabhan and Ashirwad accompanied by his son, Arnav. As always with a PNLIT programme, it started on time with the first Indian Idol Junior winner, Anjana Padmanabhan taking the viewers on an amazing Bollywood musical journey that started off with a beautiful melody from Taare zameen par. 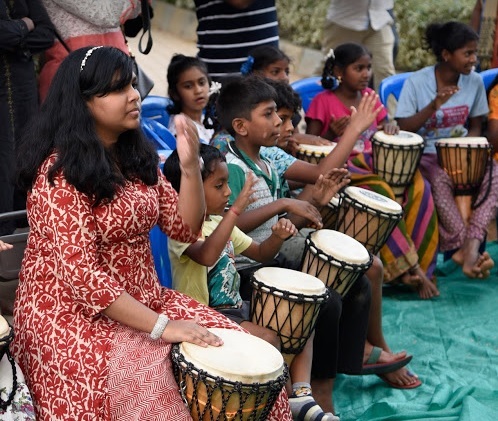 The journey traversed through AR Rahman's first song 'Choti si aasha' to 'Nannare' to 'Nagada sang dhol', drawing the kids and adults to shake their legs to these peppy numbers and twisting to 'zoobi doobi'. Anjana also managed to keep the audience engaged with a Sing-along medley of famous Bollywood songs from yesteryears for the young at heart. 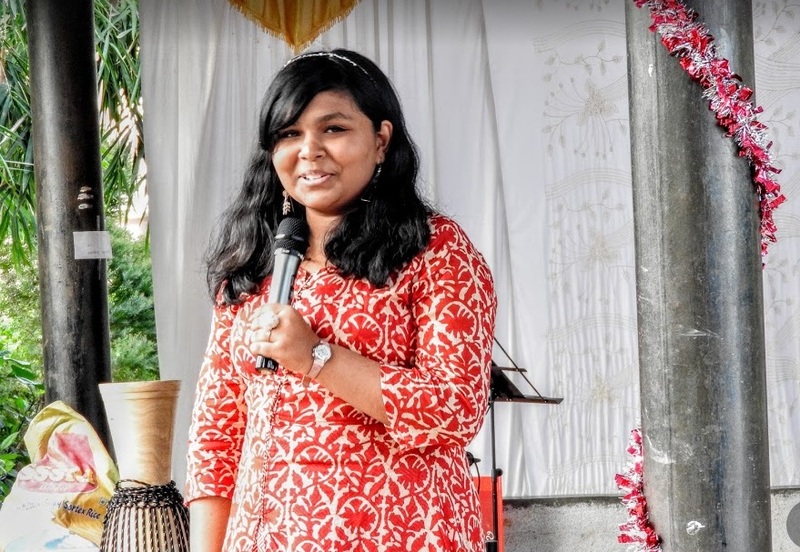 Both Anjana and Ashirwad shared their musical journey motivating the participants. 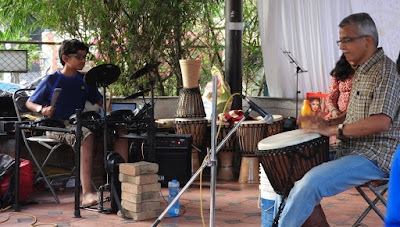 Ashirwad then performed on the Djembe while his son played the drums. This was a spontaneous drum jam that kept all the viewers tap their feet to the rhythm. 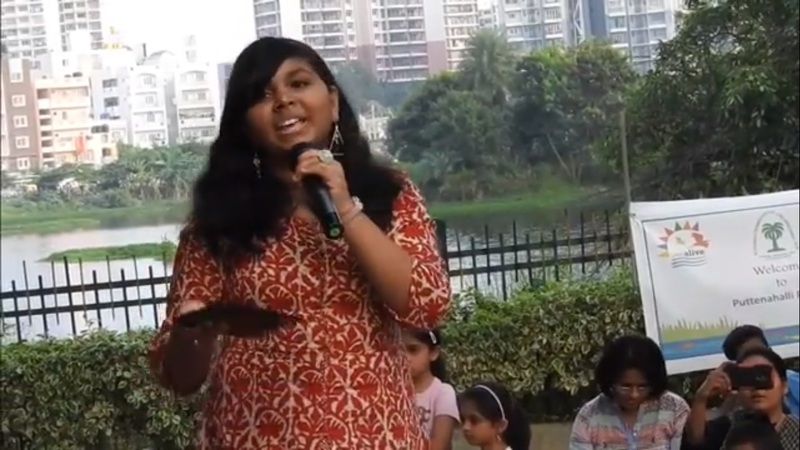 It was dusk when Anjana started Round 2 of her performances with a few more Bollywood numbers with Bum bum bole from Taare zameen par being the finale. She brought so much energy to the song that kids and elders formed a long train, came down and danced their way back between the audience. There was a lot of joy with everyone displaying the widest smiles they could have and just enjoying the moment. 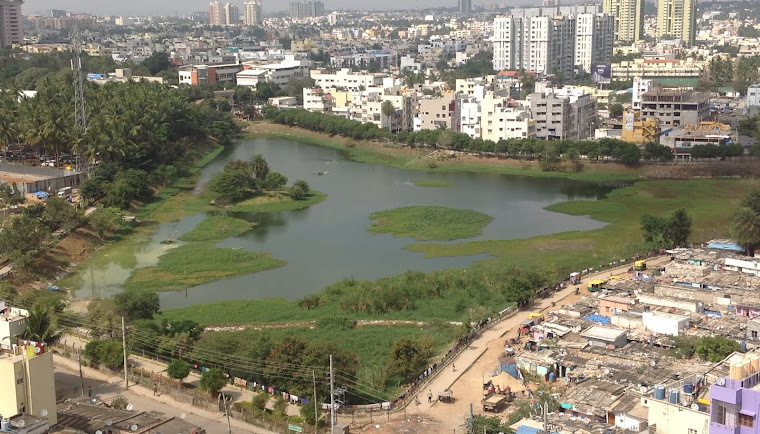 The whole lake came to life when the most awaited part of the event, the Drum Circle was formed with more that 50 djembes, tambourines and sticks all of them following Ashirwad's instructions playing in the same rhythm. The group was filled with high level of energies keeping up with the beats. The sounds of all the instruments were reverberating and resonating as the sky turned dark. The children couldn't have enough if it. 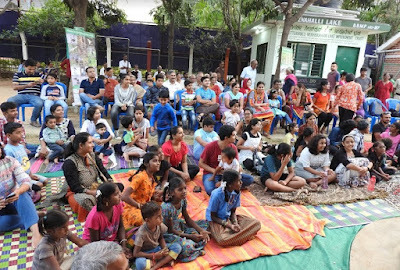 The simple change of pace and variations with so many different activities kept the kids completely engaged and attentive throughout, thanks to Ashirwad. Overall, an evening well spent at the lovely Puttenahalli Lake bringing in a lot of life and energy a perfect way to celebrate Children's Day!